Sign up HERE for read-only Premium access from now through April 13th. 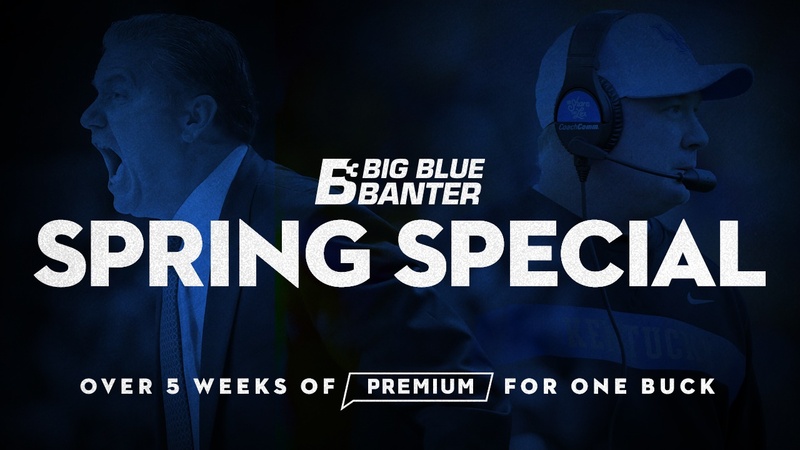 Spring practice has begun and March Madness is around the corner, so there is no better time than right now to experience Big Blue Banter Premium. If you are not currently a Premium subscriber, what are you waiting for? Our team is producing a ton of great content every day and this is your chance to get it ALL through the Spring game, for just a buck! You have from now until Friday night at 11:59:59 p.m. to sign up. You will receive a Premium subscription (read-only) that will expire at the end of the day on Saturday, April 13th. This will give you full access for the entirity of Spring practice and March Madness, as we bring subscribers the most in-depth and comprehensive Kentucky football and basketball coverage available. Option 1: Already have an account (username)? CLICK HERE and click on "Spring Special 2019"
Option 2: Don't yet have an account? CLICK HERE to set one up. During the registration process, be sure to select "Spring Special 2019"
Jump on this limited time offer. Yesterday alone we posted combined evaluations, a massive 2,000 word recruiting article with 27 recruiting updates including 18 four-star recruits. Just one more day after today for this great spring special. 5 weeks of premium membership for just one dollar. Covers the entire March Madness and Spring Practice. Roughly 37 minutes and counting left on the special. Jump on while you can.